Moroccan preserved lemons bring bright notes of citrus, vibrant saltiness and muted, complex tartness to your cooking. Preserved lemons gain their characteristic flavor through long, slow fermentation, and it’s this traditional process that breaks down the lemons’s rind, removes its bitterness and gives you a marvelously complex, bright flavor that pairs beautifully with roasted chicken, grilled fish and braised vegetables. What to preserved lemons taste like? The flesh of preserved lemons is bright, salty and citrusy, and you can use it to make sauces or in vinaigrettes. While the flesh is nice, the rind is particularly valued, and it loses its bitterness during fermentation leaving a pleasantly tart, salty, floral flavor that is well-suited to a variety of dishes. How long do preserved lemons last? Fermentation, or the process of preserving lemons the traditional Moroccan way, takes about a month or two, depending on the volume of lemons you plan to preserve. More lemons require more fermentation time. Lemons are ready once their rind becomes pliable and loses its bitterness. 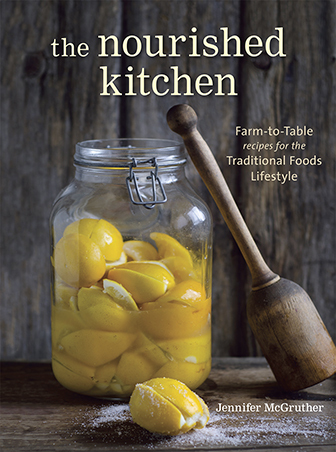 Once they’re properly fermented, preserved lemons will last six months to a year. You can store them in the refrigerator; however, they can also be stored at room temperature because the salty, acidic brine created during fermentation acts like a preservative. How do you make preserved lemons? To make Moroccan preserved lemons, you’ll need to first select your lemons. Thin-skinned lemons like Meyer lemons work particularly well since they require less time for the rind to soften and release its bitterness, so they are done and ready to use faster than if you use thick-skinned lemons. Meyer lemons also offer a complex floral notes, which enhances the flavor of your finished lemons. Since you’ll also be eating the rind, look for organically grown, unwaxed lemons, if possible. Cut the lemons first by trimming their ends just enough to expose the white pith without exposing the flesh, and then quarter the lemon length-wise, keeping the base intact and without fully separating the quarters. You’ll add salt to the interior of the lemon which helps to preserve them. Pack the lemons tightly into a jar, preferably one with an airlock which helps to prevent mold formation, and weigh them down with a glass weight so that the brine created by lemon juice and salt keeps them submerged. Let them ferment until the rinds lose their bitterness, about a month, and then they’re ready to eat. Preserved lemon is a traditional North African condiment where its sour and salty flavor is adds a distinct flavor to classic tagines, roast chickens and other meals. Trim the tips from the lemons without exposing the flesh. Slice the lemon lengthwise into quarters without slicing completely through and keeping the quarters connected at the base. Sprinkle the inside of the lemons with a generous pinch of salt, and then pack them tightly into a 750-ml jar, and sprinkle each layer of lemons with additional salt. 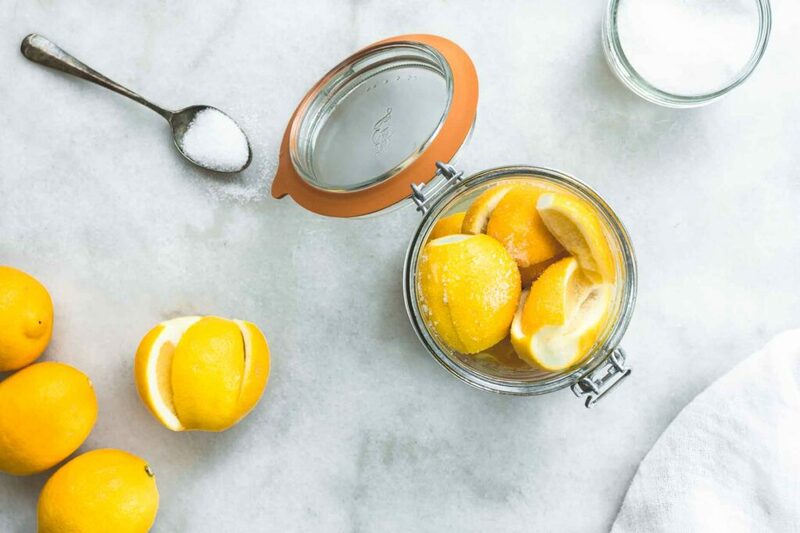 Press the lemons tightly in the jar so that they release their juices, and so that the lemon juice and salt combines into a brine that completely submerges the lemons. Place a weight over the lemons, and seal the jar. Allow the lemons to ferment at least one month, before trying them. Lemons should ferment long enough so that the pith loses its bitterness. Variations. You can also add cinnamon sticks, hot chilis, bay leaf and black pepper to your lemons as they ferment. What you need to ferment lemons safely. Preserved lemons, like many fermented vegetables, relies on a process called lactofermentation that encourages the proliferation of lactic acid-producing bacteria. These bacteria thrive best in anaerobic conditions, or without the flow of oxygen. Oxygen exposure in fermented foods can also leave the foods more likely to mold. So it’s best to use an airtight fermentation crock and weigh your lemons down with a glass weight. Fermented lemons have a pleasant, complex citrus flavor that pairs beautifully with savory dishes. They marry particularly well with chicken and fish dishes, and you can also use them to make condiments and sauces. In most culinary applications, you’ll discard the preserved lemon’s flesh, and reserve its rind; however, both parts are edible. Savory-Roasted Chicken with Lemon blends preserved lemons and fresh herbs with chicken and root vegetables. Preserved Lemon Allioli is a bright, citrusy condiment made with lemon, olive oil and garlic. Preserved Lemon and Parsley Tapenade is an excellent condiment to serve on top of grilled fish. Oh, you are taunting me with these beautiful lemons! I am just dying to make some, but there are NO meyer lemons to be found in this town! The horror, the horror. It just says “preferably Meyer Lemons”. Doesn’t say it has to be. These look good, I have been reading your blog for a while, and it is really interesting. However I was wondering if this would work with Limes too? I did a Google search for images of Moroccan preserved lemons and saw images of both preserved lemons and limes. Very pretty. Rosy! It’s always nice to hear from a reader. I’ve never tried it with limes, or heard of anyone else trying it with limes; nevertheless, there’s absolutely no reason why this technique wouldn’t work with limes. Frankly, I think preserved limes sound fantastic. If you try it out, let me know! Pickled limes were a treat referred to in Louisa May Alcott’s Little Women. Amy gets in trouble for bringing them to school. I’ve always wondered what they were, and I’m guessing this is it! Hey, how about oranges or grapefruit ? Can get carried away here and have fun . A woman at my local farmers market gave me some preserved oranges. They were amazing! We make salted limes, just like this recipe. We live in Hawaii, and many people make salted lemons, (more common), or limes in glass jars left in the sun on their roof. The salty lime juice is fragrant with lime essence, and because of it’s saltyness, doesnt go bad. It does have a little (bitterness?) that is typical of limes. A little of this juice goes a long way. I add a splash to salad dressing, and would imagine it EXCELLENT in margaritas! It’s way better than the bottled lime juice avail in the market which I wont use/dont care for. Hi, I know this is a redundant question but I want to preserve lemons in a used capers jar. I boiled the jar for 15 min then cut and salted covering the lemons as instructed. I am concerned if this technique is ok for canning safely without using a mason jar. I am just being nervous canning for the first time. I love the idea of preserving limes! I just bought a bunch of meyer lemons & did this with them a few weeks back and bought limes at the same time to juice & freeze but that is a great idea! I love your blog. Annettes last blog post..How Much Does it Cost to Eat Sustainably? Jenny, how do you use these? Do you substitute them for fresh lemons called for in recipes? I’m just wondering what you do with so many! Would this work for lemon juice in recipes? And I echo the previous poster. I need to know what to do with a gallon of lemons … but lemon juice I know I can use! Mostly you use these as a condiment – served with roast chicken along with spiced olives. Or chopped up fine and used on top of fish and poultry. Remember, because they’ve been fermented they last FOREVER much like sauerkraut or cucumber pickles so there’s no urgency in using them. Regarding the lemon juice, it makes a really tasty addition to a good bloody mary. Keep in mind that the juice is salty, so it’s not suited to sweet dishes. I was so excited to see this recipe. I remember my mom bringing home a jar from some Egyptian friends of hers when I was a kid. I would eat them on there own – loved them! A couple of questions: after they are done fermenting do you place in frig? If so do they not last as long once in frig? Do they have to be Meyer lemons? And if so why? I put them in the fridge to slow down the fermentation process once they’re done to my liking. You could, ostensibly, keep them in a cool dark place in your home with no adverse effects. In the fridge, they keep FOREVER or close to it. I have about 1.5 gallons in there right now that I did in December and they show no signs of spoilage or mold. They should probably last at least a year. Take care though because, as with sour beets, the juice will thicken with age and you always want the fruit to be below the brine so, periodically, you’ll want to mix sea salt and water together to add to the lemons. Also try this recipe: Preserved Lemon & Parsley Tapenade. It’s a GREAT way to use preserved lemon. You never said if you can use regular organic lemons. Do they have to be Meyer lemons? If the liquid turns cloudy and looks thicker, instead of becoming clearer and more like water, does that mean it has spoiled, not fermented and is not a viable food product anymore? I was adding brine to cover when the fluid was low. Did not use a sealed jar, but left the ring off, used a glass weight, and put the lid over it. Has been three weeks in moderate, low sixty temp out of direct sunlight. The Indian lime pickles I made a couple years ago got really nice and thick — the liquid turned almost gelatinous. So delicious. I can testify that these last well over a year. I think I forgot mine were in the fridge, because they went faster once I remembered they were there. The brine, over time, becomes syrupy and thick, almost sweet. The thing I don’t understand is why it’s important to keep the lemons together instead of cutting all the way through. I found that very awkward for actually using the lemons because I had to remove the whole thing and cut off pieces and then put back what I wasn’t using. I cut all the way through when I did limes, and no problem. Next time I’m going to try slices. The recipe in the Nourishing Traditions cookbook for preserved lemons calls for slices. Although, it also calls for whey and cinnamon too. That’s the recipe I went with… can’t wait for those suckers to be ready, I’m salivating just thinking about them. Thanks for verifying that these lasted over a year for year you. I followed the recipe to the letter but my lemons went slimy. Is this normal? I don’t want to try them for fear of botulism! Botulism is not a threat I fermented foods due to acidity level, so don’t worry about that. That said, if your lemons are slimy, you should toss them. It sounds like you didn’t use an air locked fermenting crock, which is fine, but it leaves ferments open to contamination. What if you were over generous with the salt. I am 3 days in and got plenty of juice with my lemons, but a whole lot of salt settled at the bottom the jar. Is it complete disaster…ie should I start over? Mmmmm. These lemons look amazing and I can’t wait to make them! Thanks for the recipe! If you cannot use up 10lbs of lemons just use a smaller jar. I just opened my lemons after they had been fermenting about a week. Are they supposed to be fizzy? They smell wonderful….will be trying them later today! Hi, I just made these and they’re fizzy too. Did you get an answer…is the fizz okay, or have they gone bad? Fizz or carbonation is a normal byproduct of fermentation. As the bacteria eat up the sugars in a food, they release CO2. When using a fermentation crock or device designed for fermentation, this gas is released and the ferment isn’t fizzy, but if you’re using a crock or jar that cannot release the gas (such as a mason jar or a fido jar), the ferment will be fizzy because of all the built up gas. Mine developed a thick, black layer of mould on top…..are they ruined?! I love preserved lemons and because we don’t get lemons or Meyer lemons in India, I’ve done a jar with just limes, and another with limes and tangerines both from Ottolenghi: The Cookbook. Their recipe has rosemary sprigs and red chillies added, and a dash of olive oil too. The results are delicious! i recently tried this with meyer lemons and the flavor just burst in your mouth. I’ve done this many times and love it. I like to lay slices of lemon on top of a beef roast just a while before it’s done roasting. Adds a fine flavor. I have to say, though, as much as I like this site I cannot use the sources. I’ve tried to get my computer security to let me open the sources, but in order to do that I have to turn off my entire security program. Not gonna happen, that’s WHY I have security in the first place. You and Kelly the Kitchen Kop both need to figure out a way to make your resources more accessible. Those are the only two places I ever have any trouble at all. Just post the links instead of setting up hyperlinks, for heavens sakes! D, try a different browser. I cannot access the sources in Firefox. I can in IE or Chrome. I use Chrome and haven’t specifically enabled any adblocker or any other blocker, and I still can’t see any of the resources links. The links work in Safari. i do a similar recipe from one of madhur jaffrey’s old cookbooks… it’s just limes rubbed with a salt-clove-fresh-ginger-cinnamon mixture and stuck in a jar for months. by the end, they were like candy, with an edible rind like you said. I’d love to know which Jaffrey cookbook you have that you like best and that has the preserved lemons with salt-clove-fresh ginger-cinnamon rub. Thanks. Today I will be making these preserved lemons. I lucked out at the market with finding gorgeous organic Meyer lemons! My question is about washing them; my water has a little bit of chlorine in it. I’m concerned that the chlorine will damage the naturally present good microbes on the rinds, and inhibit proper fermentation. They look lovely and perfectly clean, but it’s hard to know for sure what’s there that is invisible. Which would be better. I suppose I could rinse them in a bowl of filtered water, but again, I had thought that there were good yeasts hanging out on organic produce skins. To wash or not to wash… that is the question. I am somewhat new to the fermenting world. I made this recipe in a much smaller batch and after a couple of days mold started forming on the top. There is a layer of mold now. Can I remove the mold and still use the lemons? Absolutely, I have made and been using my first batch of preserved lemons from a recipe in my middle eastern cookbook, and as it said in the book, some fuzzy white mold can occur, it also says that is fine to just wash it off before using the lemons, if you make sure that the lemons are submerged in brine the mold shouldn’t grow, they are delicious and I use them when making roasted chicken with rosemary yum. Question about the jar: can a large, regular glass jar be used, or is it necessary to use the food fermenter that you mentioned? Also, has anyone ever tried this with oranges? 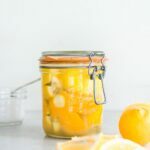 I strongly prefer fermenters, but any jar will work as long as you have a weight to keep the lemons submerged in brine, otherwise they will mold. I haven’t tried it with oranges, but I have tried it with limes and WOW! that is good. do the fermenters come with weights ? if not….what do you use as a weight ? thank you. CulturesforHealth.com sells fermentation weights. What’s not clear from their site is that each weight is a set of weights. So I ordered two when one would have been enough. But, now I’m glad I have extras. You can also use nicely sized rocks from the beach or rivers, etc. Wash well. I bought a jar of preserved lemons today at the farmer’s market and made the tapenade to go with the Moroccan-spiced roasted chicken (which I love!). The tapenade is so salty that I couldn’t eat it. Are the preserved lemons supposed to be extremely salty? Could you post a picture? I can not envision what the almost quartered lemons are supposed to look like. Would slices work as well? Hope I’m not too late and you still see this…I thought this video might help, shows how to make preserved lemons, her method is ever so slightly different but you get to see how the lemons should be cut and yes, according to this vid, you can just slice them, with the added bonus that they will be ready sooner. I made these lemons and fermented them for 2 weeks. I am not sure where I went wrong and if I need to ferment them longer. I tried them this morning and they just taste like a salty lemon rind. I used meyer lemons and they just don’t taste like I thought they would. I am wondering what I can do with them at this point. Any suggestions are welcome. Many traditional preserved lemons are simply salted lemons. The fermentation process isn’t necessary to use them. Try soaking the rinds for about 15-20 minutes in cool water. Slice them up and add them to a salad of tomatoes and cucumbers with lots of herbs, olive oil, a little crushed chile, and fresh lemon juice. Or mash them in a mortar and pestle with olive oil, basil, mint, parsley, and whatever other fresh soft herb you have available to make an embellishment for fresh fish cooked however you like. Something a little different: chop them up really fine and sprinkle them over a watermelon. I do SO wish you would just list the entire web site of the places where you like to buy things and the things you like to buy. Your “sources” page doesn’t work for me, never has. I’ve unblocked all my pop-up blockers and yada yada yada but nothing seems to work to open them. Can’t you (and all the other nutrient-dense bloggers) please just list the entire web site url?? Thanks for your kind attention. I would love to use some of the products you talk about, but I have no access to them if I can’t open the link. If you’re using an adblocker, you will not see anything on the resources page. If you disable your adblocker, it should work. Here is a great recipe to use your preserved lemons. If you don’t have a tagine just use a dutch oven. I personally would skip the couscous, but a wonderful recipe none the less. Any reason I can’t use regular organic lemons from our co-op? Of course you can. Meyer lemons are my preference, but certainly not required for the recipe. In fact, when shooting the video – I don’t think I used Meyers. Jenny, are you supposed to cover with a cloth or cover tight if using a jar? Thank you! Just a loose lid should work. Good question! I’m not familiar with the product, but I imagine it would work. So glad you are covering this today. I’ve made them years ago and loved them as a flavor enhancer for just about everything. Thanks for reminding me. IT’s about time to try again. Thanks for posting this! It’s been on my list to make a batch of preserved lemons and this is reminding me to do it. I love your blog. Sally Fallon says to put a tight lid on your ferments while they are brewing, & Sandor Katz says to only put on a secured cloth. It looks like you are of the lidded approach, but I wanted to find out from you which you think is better. Also, where did you get your “picklet” (don’t know if my spelling is right)? Thank you, you are a gem! I put a loose lid on ferments that aren’t in an airlocked device. I don’t think it matters significantly as your ferments will be safe if the solids rest below the level of the brine. How to know which ferments need an airlock & which need the natural microbes in the air? No ferment absolutely must have an airlock. Thank you! Excited to try this! Can you ferment limes instead? Other citrus fruits…oranges, grapefruits? Thanks. I am going to try this! Both the limes, and the other citrus fruits. I think if the Lemon ratio is high enough, you can get away with adding in some oranges. I just started a batch today and I see that I have room for probably four or five more lemons in my jar. I made a brine and used a little whiskey glass to smoosh the lemons below the brine before popping on the “loose” lid. Could I buy more lemons this evening and add them to the jar tomorrow since that would require pouring off brine and any juices that accumulated overnight? Awesome, unique ferment. Thanks for the tutorial! I’m adding Lemons to my FoodStamp List. 🙂 Can’t wait to try these! When I preserve citrus, I use a 3-1 or 2-1 ratio of salt to sugar. The added sugar doesn’t interfere with the preservative qualities of salt and produces a much less abrasively salty end result. I’ve done lemons, limes, and oranges of all varieties and kumquats too! Currently, I have some other fruit and even vegetables canned in the same salt/sugar mixture, some with aromatics such as herbs, chiles, and spices. Test batches are still in their beginning stages and I expect mixed results but there’s nothing worse than throwing away produce when the east coast season is so short. Funny, I am reading this as I sip a drink I concocted with a little lemon preserve. I made a jar more than a month ago and am looking for ways to use them. It is a hot day here which means I need salt so I decided to add a little lemon preserve to my coconut water, ginger tea, fizzy water blend. It is really refreshing! I finally opened my jar of lemons that I started last December. I made roast chicken with one sliced in half amongst the juices. It was heavenly! Next time I will ferment thesm in my fido jars since I did get a mold cap that was pretty funky. I tossed the first two layers of lemons. I used a 2 gallon jar and forgot about it for far too long. Thanks for the idea! I’ve read that if the lemons are not bone-dry when you pack them, you’ll get mould. It’s something about tap water. As well, you don’t have to worry about oxidation if you keep turning the jar upside down every so often. Needless to say, I use real lids when I make my lemons. And, to the person who said her lemons were too salty, you need to rinse them off before you use them…depending on your taste and what you’re making, that is. I never rinsed mine! The longer they ferment, the milder they get, in my experience. Are you referring to the olives or the lemons in the first paragraph of “fermenting lemons in morocco? doing well I don’t see any molds but some of the rinds are now above the brine. with this be an issue? You always want the fruit or vegetable to be beneath the brine. Try a weight to push the lemons down. So, then how and with what do you eat these lemons? This is probably already addressed in the comments, but I didn’t feel like reading every one since it was a long feed. Just made some in a big half-gallon Ball canning jar. 🙂 I’m wondering if they should be in a dark place. Or can I leave the beautiful jar on my kitchen counter while they ferment? TIA! I’ve seen similar recipes that say to put the fermenting lemons in direct sunlight for a couple months. They should be fine on your counter. And used my Moroccan preserved lemons and left out the salt. Oh. My. Goodness! It was delish! Thank you, Jenny, for sharing your wisdom! I made these about 2 months ago, and despite my love of ferments, I’ve been nervous to try them, wondering how the sourness and saltiness could possibly be mellowed. But for lunch today I had a lemon quarter with some baked wild salmon. I cut a small piece of lemon to have together with each bite of fish and hello! The intensely fresh taste with the citrusy sourness balances the salmon is such a beautiful way. I’m hooked! I also was unable to find organic meyers so I just used regular o. lemons, and even my thick-skinned variety was heavenly. I’m sure the vitamin C and bioflavanoid content of this pickle is through the roof, too! I tried this and could not get enough juice to cover my lemons; so then they went bad. I think I’m missing one piece of critical common sense information. 🙂 In order to get enough juice out of the lemons to cover them, you must have to squish the lemons until they’re a pulpy mess? Help! It looks like you skipped step #2. Just reading the questions and issues with washing the lemons in tap water. I have never done any canning or worked with organics, but it seems to me that you would just use a purified drinking water product. Could you use purified water or some organically safe water? I had a bunch of lemons in my fridge that I needed to use up, so I followed this recipe using a lock-top Ball jar with the seal. After i finished cutting, salting and packing them, I realized that I forgot to wash them first, and they’re not organic. They’ve been sitting on my counter for 5 days now and I’m petrified to taste them for fear of botulism. Should I dump them out and start over?? The pH of lemon juice is about 2. And salt also inhibits bacterial growth. You can test the pH just in case before you eat them. Botulism isn’t a concern here. Lacto-fermentation is the safest method of food preservation. Botulism can be an issue in an anaerobic environment as in pressure-canning. My lemons didn’t make enough brine to cover, so I topped it off with lemon juice from the fridge. Then I noticed that that contained some preservatives. Is all lost? You got a new follower. Awesome job. Thanks! Can I use himalayan salt instead of sea salt? Anyone ever try this with limes? Any reason why you couldn’t? It will work with limes. There’s a traditional Vietnamese recipe done with limes, same overall technique. I was wondering if I use glass mason jars do I seal their lids or leave them open to the air? My husband made these years ago and used them as a basis for chutney. Heavenly. Yes, limes work wonderfully as well. I like to eat them paired with roasted duck and potatoes. Although sometimes I stuff them inside chickens and turkeys to add an additional level of flavor, it’s always a hit. Not sure if this post is still being followed, but everything looked “normal” until my last (4th) week. There is a thin, mostly whitish film on top of my jar. They dont small bad, but then again I dont have a great nose. Should I be concerned? It sounds as though you weren’t using an airlocked device which can help to prevent microbial contamination of your ferments. Open up your jar, spoon of the film, and continue to ferment. If you’re in love with fermentation, you might invest in a fermentation crock. I used coarse sea salt, and the salt looks dark in the jar (after about 6 weeks of fermentation. ) THe lemons look good. Are they still edible? I went out and bought a bag of organic lemons (which are very expensive up here in Canada), so I could try this recipe. Because of all the mashing, there was pulp floating on top of the brine. I tried pushing the pulp down, under the brine. I had to go away for the weekend so I left, hoping for the best, but when I got home I discovered that there is mold growing all over the top of the concoction. So disappointing! I think this issue might be something you might want to mention in your recipe, as I don’t see how people can make this successfully without either using a fermenter or scooping out all the floating pulp. Yesterday I prepared my lemons following your instructions. I put them in 1 quart mason jars. I placed a layer of plastic film over the jars so that the acidic brine will not touch the plastic coated metal tops, then screwed down the tops tightly. My lemons float up above the brine no matter how much I push them down. The brine is to the shoulder of the jars. Will it be a problem that the lemons rise above the brine? If your lemons rise above the brine, they will mold and that will contaminate your ferment. Can I top the brine up with filtered water? Just making this from your cookbook, which I LOVE by the way! Thank you! Sure can! Best to top it with saltwater though. I have 1-2 meyer lemons that are just about ripe on my lemon plant (unfortunately this season my plant produce just 2 lemons) can you recommend how much sea salt shall I used to make this? Jenny, a month ago, I followed this recipe and made quite a lot of jars of these lemons, and gave them to friends and family as gifts. My husband is concerned about our jar of lemons because there seems to be positive pressure on the inside of the jar, and he wanted me to ask if this is a sign of the botulism bacteria, and if we need to contact our friends to caution them from eating the lemons. Additionally, it looks as if the lemons rose over the brine level (I did not use a weight, and I did not read all of the comments in this post that talked about filling the jar with additional salted water to cover the lemons). I’m not sure what to do, or if you answer any posts on this blog. I will be sending this message to you via email as well because I do not want to have caused any problems for any of us. Thank you! I am fermenting lemons, but they were not staying submerged under the liquid, so I ended up using a weight and covering with a cloth (a jar lid wouldn’t fit with the weight I used). Is this ok, or does it absolutely need to be sealed? Also, if it does need to be sealed, is there any harm in doing so after the lemons have been out already for 4 days with just a cloth? Thanks! Tara, you should keep them in a tightly sealed container; however, 4 days with a cloth cover is fine. This is a conversation you had with a reader above. I’m just confused b/c you have said here that a tightly sealed container should be used… Do both work?? “Jenny, are you supposed to cover with a cloth or cover tight if using a jar? Just a loose lid should work. Hi Brodie! You caught me in a moment of self-education. When this post was initially posted, and comments initially answered, I was less familiar with fermentation than I am now. While I had success with a loose lidded jar (which was easier, since I didn’t need to burp it), I had greater success in future years with sealed fermentation vessels. Fermentation still works in loosely lidded jars, as long as contents stay submerged, sealed crocks work much, much better and are representative of how I ferment things now, and plan to continue in the future. Thanks Jenny! I’m thinking about buying a fermentation crock b/c I am starting to do more fermentation and like you said the crocks are more effective. Absolutely love this recipe, Jenny. I don’t think I can live without a jar of preserved lemons around anymore. They’re so bright and intense. Thanks for this! Two words… (well three)… Avocado and Preserved lemons… OMG! I’d also like to add here, for those who find their lemons floating, you can turn the jar over every night to make sure it all gets a good soaking. After a while the lemons will sink – I suspect when they’re initially fermented. Personally, I didn’t have enough juice when made these 10 months ago, but I shake them up every time I used them and they’re fine. In fact, now that more time has gone by, and the lemons have darkened a bit in colour, I’m finding myself wanting to gorge on them! I’m going to try limes and oranges this year. 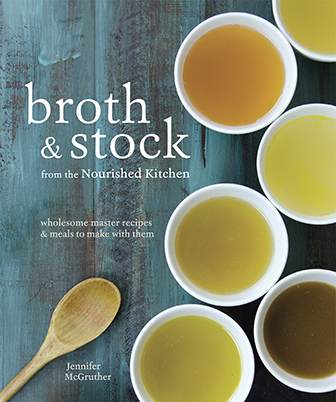 As someone who doesn’t have a fridge this is a great addition to my fermented foods collection! I made a batch of preserved lemons a while ago. They are still in the fermentation crock. I am a bit worried about my lemons, I was only able to fill the crock to half. Thus the rest of the pot is air. The crock does however have an airlock. Will my ferment be fine? Hi Elzaan, if there’s a lot of air in your crock, even with an airlock, you’re likely to get mold. Make sure that your lemons are completely submerged in brine, and check every few days – skimming off any mold as it appears. How is this served? Reading your article, it sounds as if the lemons are sliced and served flesh and rind. I saw another article that says that what you are after is the rind. I didn’t see any reason to waste the flesh, nor any reason not to eat it, also. Many recipes call only for the rind and discard the flesh; however, when I was served preserved lemon in Morocco, they were served and used as both flesh and rind which is how I use them. If using a mason jar with a screw on lid, should I tightly screw on the lid or leave them loose the way one does when fermenting sauerkraut? You would screw them on tightly. I love lemon on my salmon, steamed broccoli, roast chicken, and to tone done anything too salty tasting on my plate. I just bought my lemons today and will be doing this. And after those 3 or 4 weeks, they’ll be making an appearance in a moroccan tajine recipe I found too on Pinterest. I love that you shared your personal experience from your time traveling. It is great to see how and where these lemons came from. The origination and birth of their use in a culture is something to cherish. These look great. I really want to make them at home along with many of the other recipes you share on this great blog! Thank you! I want to use the lemon juice for chillies and garlic soom. Will the lemon juice remain bitter. How can I remove bitter taste. Should I add vinegar? Or perhaps I should use juice only without lemon peel and pulp? Lemon juice is generally sour, so if yours is bitter, I’m not sure what guidance to give you. HI, Jenni! I tried to make the lemons but they quickly started smelling off, and they were trying to escape the coverage of brine, so I tried to add more sea salt filtered water, which didn’t really help. Any tips? I used simple mason jar, thank you! You might invest in weights which will keep your lemons submerged. Also, you might press down your lemons more effectively when you start your preserved lemons, as they’ll have a harder time escaping. What if you accidentally throw the brine out? Can vinegar be used in replacement? I recommend salt water as a replacement. I’m new to this but do I put an airtight lid on the jar? A mason jar works fine. We have 2 Meyer lemon trees drooping with lemons almost ready to harvest. This recipe look so good, I will certainly give it a try. Hi, I have your book too. I’m confused about the fermentation or preservation process (you’ve used both of those terms). Should the jar or crock be “sealed” as stated in your book, or should the air be allowed to escape? To me, sealed means closed system, as in a jar lid that screws on tight, which would be preservation. I’ve seen various recipes out there some call for closed system, others with an airlock type method. So please clarify which this is. I’m not even sure how the results would differ. My understanding is that citric acid retards fermentation (as in lacto-fermentation). Thanksks! I’m glad you asked. When I say “seal” the crock, I mean that you want it closed tightly, and, if you’re using a fermentation crock or a jar fitted with an airlock, the air should be allowed to escape. The keep is to keep oxygen out, or to eliminate airflow except for the release of co2. I love your site and recipes. I made these lemons several years ago, when I first got your recipe. I love to cook with them. They make the best roast chicken ever and I am not a fan of chicken. I want to make them again but have family members with sea salt allergies. Can you use regular canning and pickling salt for these? Thanks for all of your wonderful recipes. Doesn’t sealing the jar before the fermentation process is complete run the risk of causing the jar to explode? If the jar is fitted with an airlock, the carbon dioxide that builds up during fermentation, the airlock will allow for its release. If you’re using a sealed jar without an airlock, it should still be fine, but you might want to burp it once a week or so. Your recipe came just in time as I bought a large bag of organic lemons to make lemon extract with…and still have lots of lemons. I make kombucha regularly and look forward to this new lemon fizzy concoction! I was wondering does sour cream have whey too? Can that be used? Also I picked a lot of blackberries and froze them last summer…time to do somethign with them? Can they be added to these drinks or preserved lemons? Hmmm? 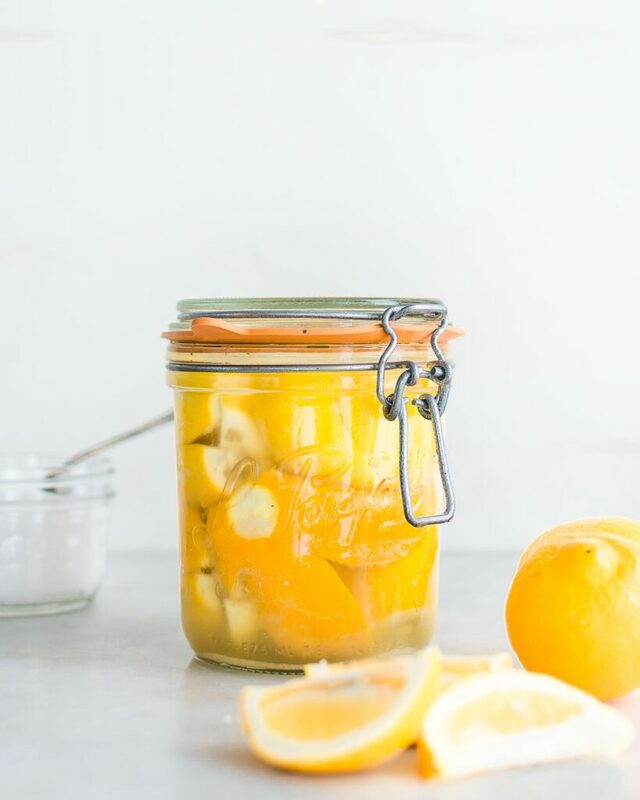 Do the lemons once jarred ferment at room temp or in the fridge for the month? Fermentation takes place at room temperature. These are so good with roasted chicken!